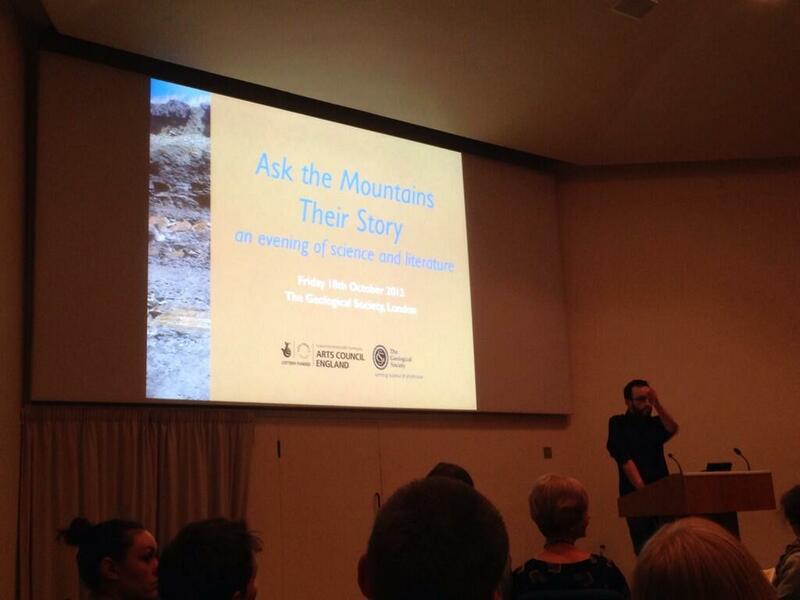 On Friday 18th October it was a pleasure to host an evening of science and literature at the Geological Society in London called ‘Ask the Mountains Their Story’. I thought I’d post here the introductory text which I wrote for the programme. This evening’s event marks the end of my year-long collaborative project with earth scientists, researching geology and climate change. 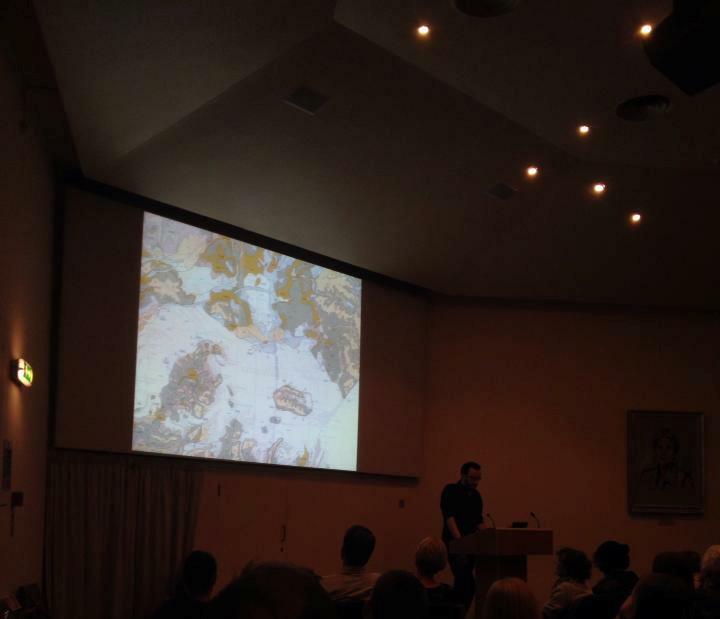 In many ways, however, it is also the end of an idea which began two years ago at an event – Poetry and Geology: A Celebration – held in this very lecture theatre. On that occasion, Dr. Bryan Lovell, the instigator of that celebratory day, offered the audience the following challenge: ‘I hope that our poetry will help to establish true environmental conviction where our scientific prose has failed us’. With the assistance of an Arts Council Grant for the Arts award I took up that challenge in June 2012, joining geologists on field excursions, attending lectures and seminars, and keeping abreast of the literature on the subject through the resources of the Geological Society’s Library. 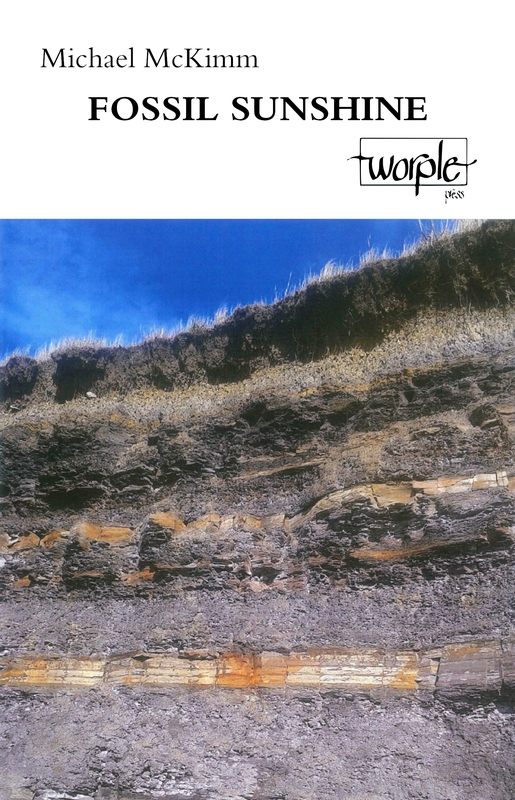 The results are collected in the pamphlet Fossil Sunshine, available from Worple Press. It’s been a year spent on beaches. In Yorkshire I stood amongst the ruins of tide defences and fallen double-yellow lines, looking at the slumped cliff coast of Holderness, and gathered Norwegian porphyry, Devil’s toenails, Baltic amber. 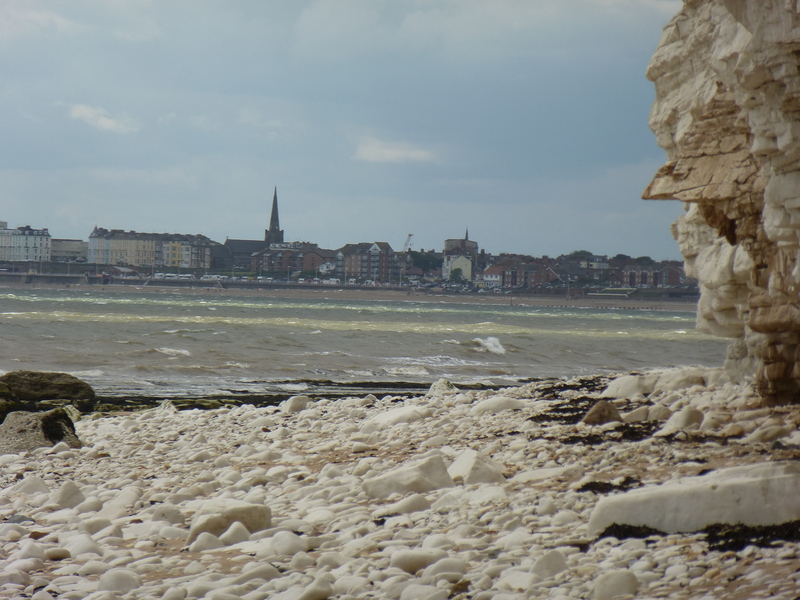 In Margate I joined a troupe of geo-historians and lugged home a flint as polished and humanoid as a Henry Moore. In Dorset I read a poem on the cliff top to a slightly bemused crowd from the BP Institute; at the foot of that cliff, in Lulworth Cove, we rubbed our hands in oil sands and learned about the intricacies of horizontal drilling. And returning home, to the Antrim coast where I grew up, the coarse black basalts around the Giant’s Causeway took on a new significance, their forging having played a possible part in global warming 55 million years ago, the 55Ma Event which dumped a billion tonnes of carbon into the atmosphere. What I have enjoyed is the practical creativity of geologists. Whether working through a problem on a raised beach, or calculating the volume of an imagined oil field, or mapping in their minds an invisible cliff, their creative approaches are ones that artists and writers should hope to emulate. They are unafraid to think of and design grand, sometimes terrifying, solutions to our climate challenge. Science backs them up, but it is imagination that gets them there. I hope that my poems capture some of the creative verve exhibited by the scientists I met, that they are not afraid to ask difficult questions, and that they don’t presume to have the answers. To me they are a record of a year of discovery and are as various as my monthly obsessions: coastal erosion to oil pipelines to the Anthropocene to lab work to geo-engineering. While looking at instances of past climate change, it is human history and human characters that figure largely in the poems: human indifference and bloody-mindedness, human stoicism, but also human optimism and ability and ingenuity. It is a pleasure to be joined this evening by three varied speakers: Sarah Day, whose The Space Between Us is a fictional account of 18th Century explorer Vitus Bering’s final expedition in the landscape of the frozen north; Barbara Cooke, whose biography Oil Men has been called ‘a vivid and absorbing piece of biography’ by former TLS editor Jeremy Treglown; and Bryan Lovell. I am delighted that Bryan has returned to talk about the science behind geology and climate change. Bryan is the firmest believer that cross-disciplinary action between arts and sciences is the best way to get the message of climate change across to a climate-fatigued public. It is encouraging, then, that this evening’s artistic intervention is one of many such projects existing up and down the country and throughout the world. And though it marks the end of my project, poetry can rarely be defined or confined by the imposition of time-scales. I hope there are more poems coming, as there is always urgent work to be done. Featuring the work of more than 180 artists and writers, including Sarah Day, this book introduces the ideas behind a unique art and conservation project, providing a platform for the artists to tell us why they got involved, and how they approached the brief – to ‘breathe life back into the birds we have lost – so we don’t lose any more’. 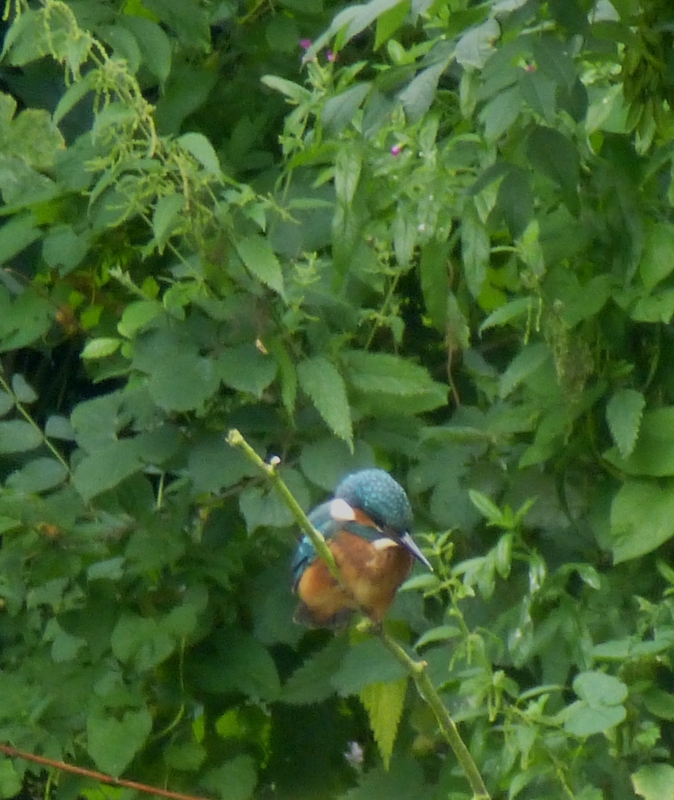 We watched the kingfisher for fifteen, twenty minutes. It sat on the very tip of a long branch, focused on the water, it’s face a little grumpy, I thought, from all the concentration. Then it dove, pierced the surface, crossed the river to another branch. Then it went to water, back to the foliage, back to the water, and to the concrete ledge where we sat, over the moon at this lately-long-sought bird sitting within reach of an outstretched arm. It was not the electric iridescence one normally thinks of, more light blue and green, fluffy rather than shiny. It seemed as much non-plussed by us as by the squabbling ducks. Z and I had stomped the River Lea for years, but today were on its curved tributary arm, the River Stort, and, having travelled to Rye Meads three weeks before on a website promise that the kingfishers were out and about, and seen none, this was not so much a delightful surprise as a genuine shock: on the towpath on the edge of Bishop’s Stortford, with the traffic belting overhead and loud groups of cyclists gliding past, a perfectly contented kingfisher, up and down to the river, branch to water to branch, before disappearing upstream towards the town centre. 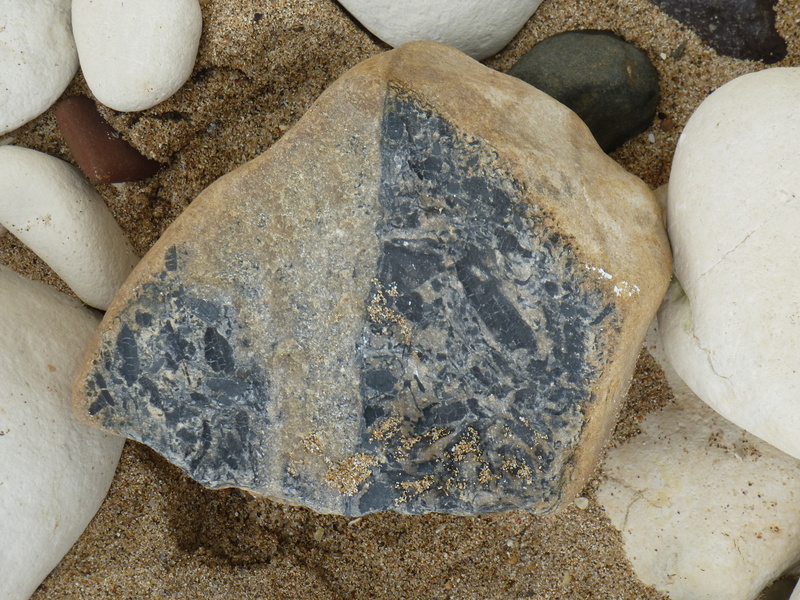 The real reason for our trip was to find some Hertfordshire Puddingstone, a conglomerate of flint pebbles in a matrix of fine pale sand all cemented together by silica, and the final piece of the Written in the Rocks puzzle. But we were also along for the ride. After Bishop’s Stortford, the canalized river widened and was flush with boats and Sunday walkers. 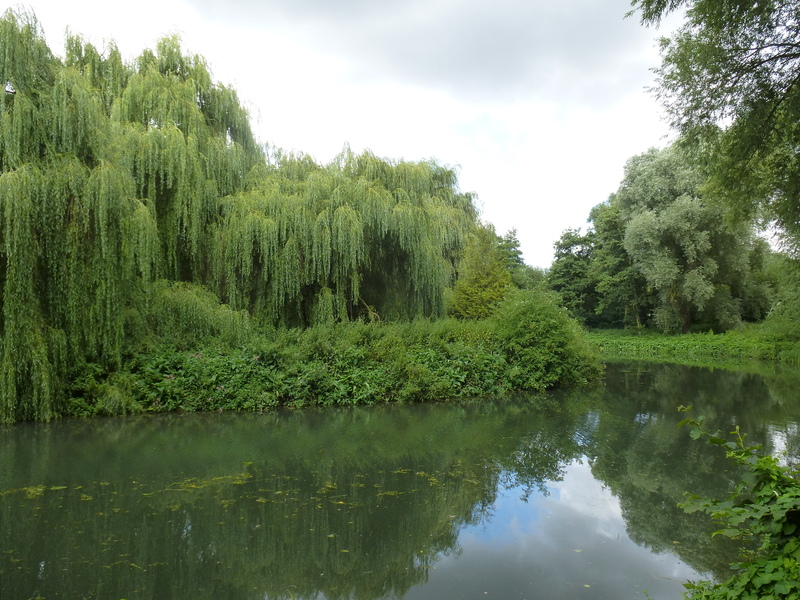 The river meanders along the Essex-Herts border, and is less managed or industrial than the Lea, its banks thick with reeds and other foliage, its towpath scuffed and narrow, its waist curled and waters clear. If it wasn’t for the locks, you would not imagine it a canal river at all, and though at one point it would have served for trade, it seemed pleasantly impractical for such endeavours. We walked on under the wings of willow trees. With the aid of a wildflower book we found Hedge Bindweed and Himalayan Balsam, Willowherb and Yellow Waterlilies. The fields and meadows revealed Common Ragwort, Goat Rue and Agrimony. With much deliberation we identified Common Comfrey (it comes in yellow and pink – today’s was pink). At some point we realised we were passing Wallbury, an iron age sixteen hectare enclosure within an earthwork; but we wouldn’t really have known it was there without the OS map telling us so: our attempted digression to see it was thwarted by an overgrown and marshy footpath. 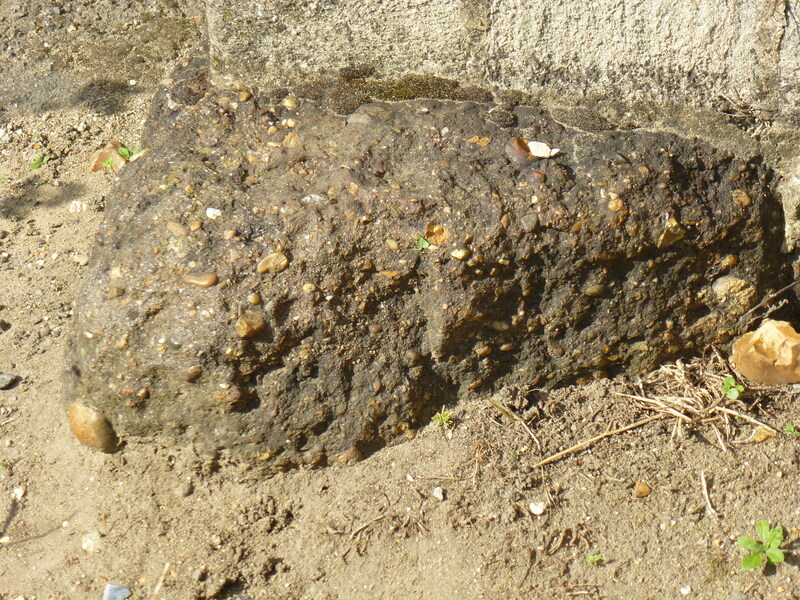 We’d not given up our quest for puddingstone, but realised that our notion of finding it in the fields was wishful thinking, so after a good pub lunch in Spellbrook, we pressed on for Sawbridgeworth, knowing there was definitely some of the stone there in the foundations of Great St. Mary church. 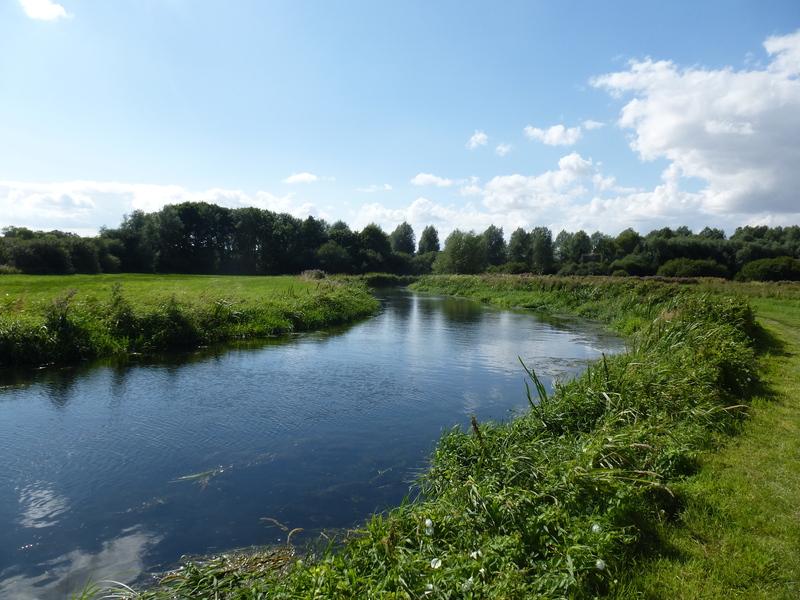 The stretch of the Stort from Spellbrook to Sawbridgeworth was exquisite, with flood meadows awash with purple willowherb, and ochre hay fields stretched out like humungous bales between the trees. It is in fields such as these that a farmer might crack his combine on a chunk of puddingstone. The stones seemed to appear from nowhere, so the superstition amongst farmers was that they grew in the fields to damage crops and machinery, and many examples were destroyed. It was also used for grinding corn. I suspect the many mills on the Stort had used it, but can’t find a reference anywhere. Nowadays, it is decorative when highly polished, and is found in towns around Hertfordshire as memorials or natural sculptures. A recent find has caused some excitement in Bishop’s Stortford. I kn ow of it through Bryan Lovell, who has posited a link between the formation of puddingstone and the period of global warming 55 million years ago (the 55Ma Event). 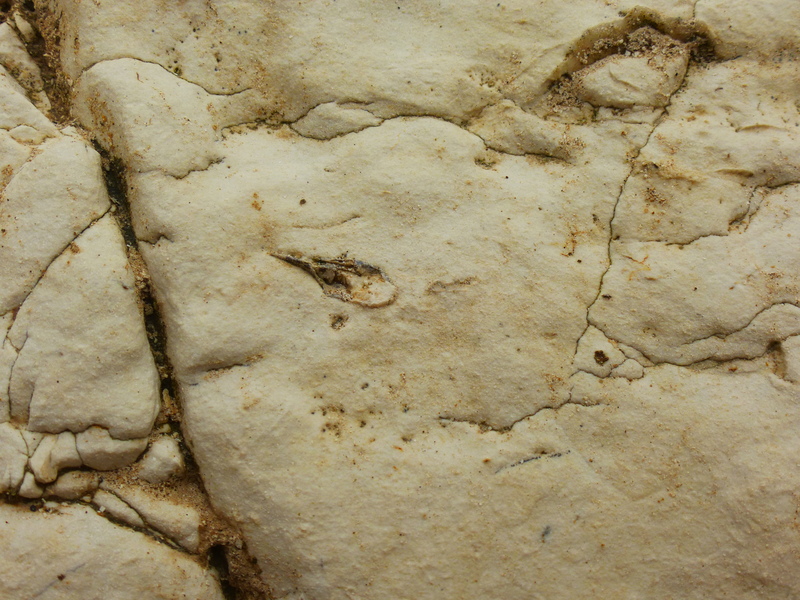 The Event – and the puddingstone – has been an important part of the ideas behind this year’s project. I’ve even got a puddingstone poem, of sorts. It was hot now, as we approached Sawbridgeworth. The day had unexpectedly brightened, casting long shadows as we climbed the hill towards Great St. Mary. We circled its flint walls eagerly, and there, at the base of the tower, built into its foundations, was the puddingstone. 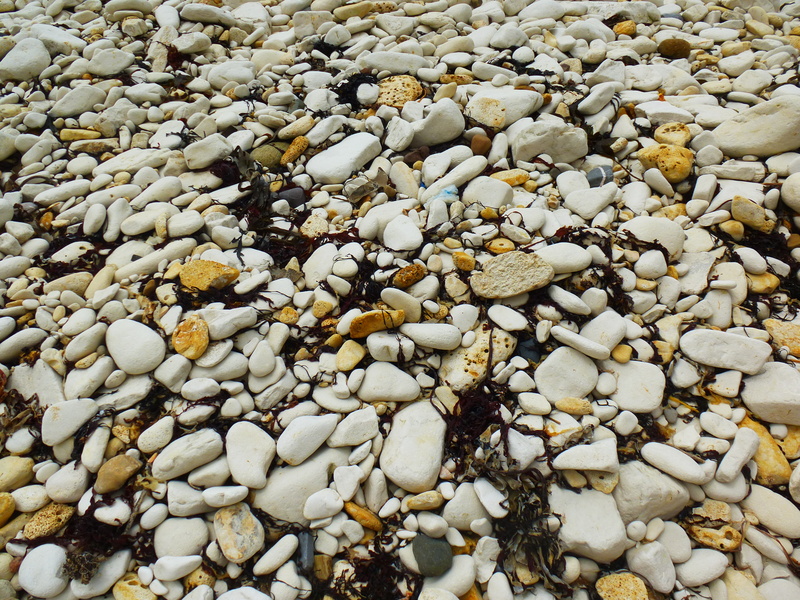 It was dark brown, muddy, but unmistakeable, with orange nuggets and f ine white pebbles. Not a cracking specimen, but a result nonetheless. 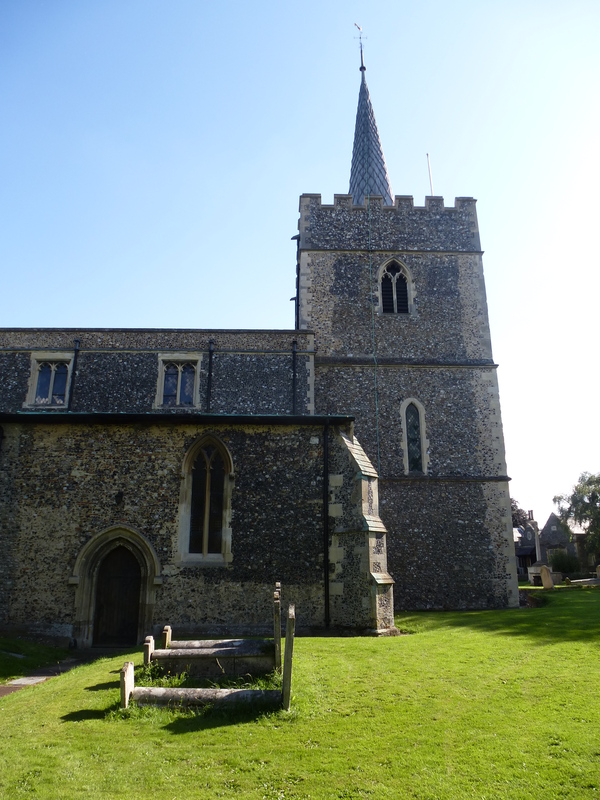 It is thought that puddingstone built into churches meant it was originally a site of pagan worship. But it may also have simply been used as a solid foundation. We took some pictures then looked round the churchyard. Through the trees the rolling hay fields hit the horizon while the valley dipped towards the Stort and our train back to London. On 18th October 2013 I will be hosting an event to mark the end of the Written in the Rocks project at the Geological Society in London. Featuring talks and readings from Bryan Lovell, Barbara Cooke and Sarah Day, the evening will also be the official launch for Fossil Sunshine. All are welcome and the event is free. Visit www.geolsoc.org.uk/askthemountains for more information and email me on michael.mckimm@geolsoc.org.uk to register. elephant, bison, deer and water vole. wild erratics found in kettle holes. 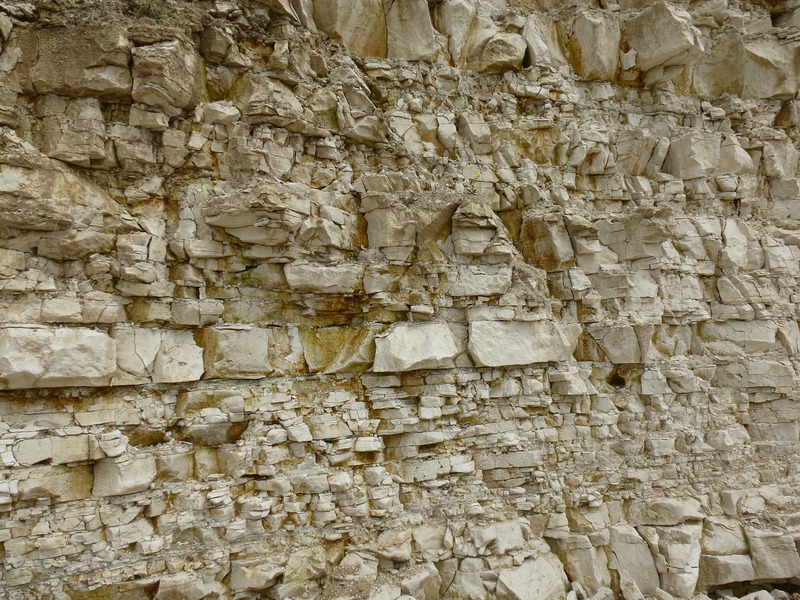 did not exist, was low Cretaceous chalk. of the last ice sheet in eastern England. Freeze and thaw has worked the sediments. with hazel wands. This is just our impulse. We’re eagerly awaiting the results. and across the thick shore platform. It’s highly complex, to say the least. their frequencies a pace-maker for change. by wave-chucked boulders and the pelted gravels. of sea urchins, piddock’s interstices. It’s the southern limit of the kelp forest. a thatch of wild flowers grows, guano-flecked. From Fossil Sunshine, forthcoming from Worple Press. I was back in Bridlington last weekend to stay with the artist Anna Kirk-Smith, who I met on my Barmston field trip in the summer, and to meet the artists Carlo Verda, Cath Keay and Jo Ray. 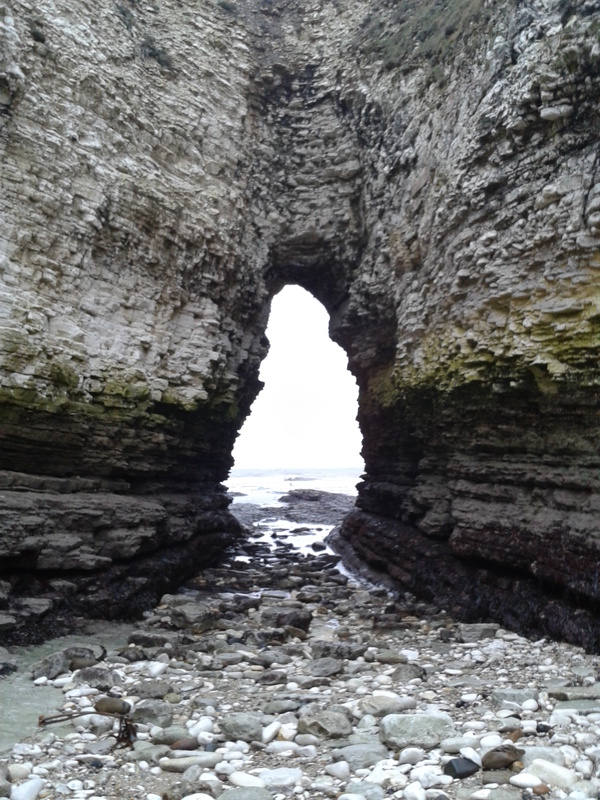 We’re working on an exhibition, based on the geology of Flamborough Head, which will take place next January in the Studio Eleven gallery in Hull. The weather outlook was not good, and we heard on Sunday morning that the geologists from the Hull Geological Society would not be joining us, which was a shame. But, with plenty of resources and Anna’s impressive knowledge, not to mention as many layers as we could possibly wear, we weren’t to be put off. 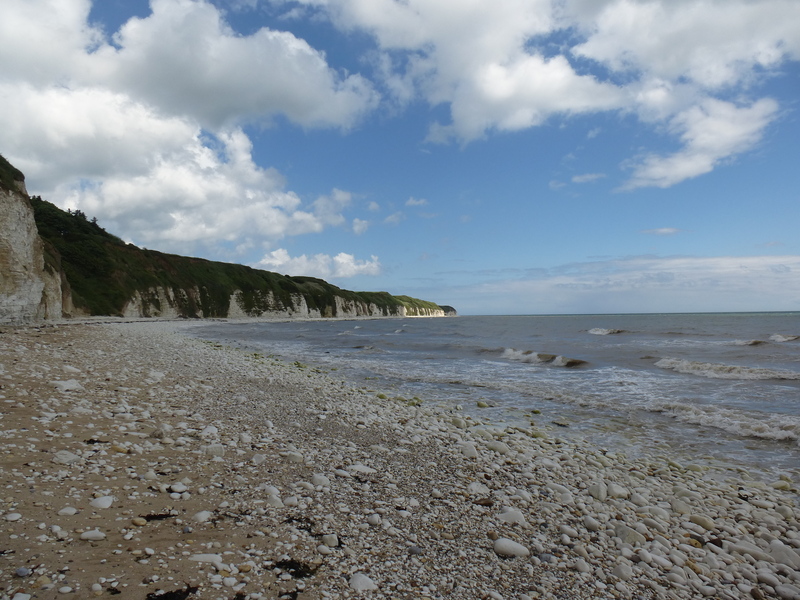 Our first stop was Selwicks Bay on the eastern tip of the headland, an area of tectonic disturbance that has left major faults cutting wildly down the cliffs and daggering across the huge chalk platform, which is visible here but stretches for miles out into the North Sea. 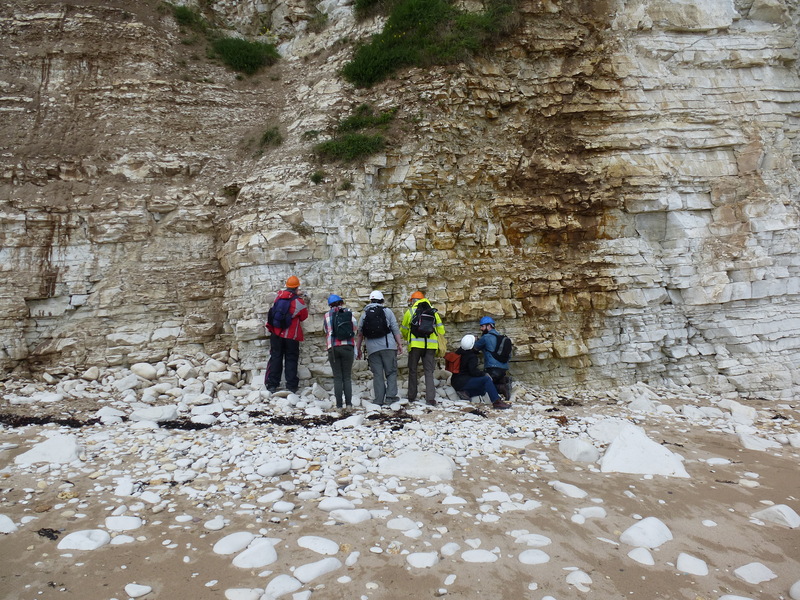 In the end we were joined by two members of the Flamborough Quaternary Research Group – whose names I did not catch – who had not heard about the cancellation. What I’ve learned to love about geologists is how, despite having clearly visited an area many times, they always find something they’ve not seen before and which they can’t always explain. In this case it was a heavy concentration of calcite which seemed unusual to them, and then later a slump in the fault-line, a tiny irregular dip. They planned to show it to the other geologists when they return in April. 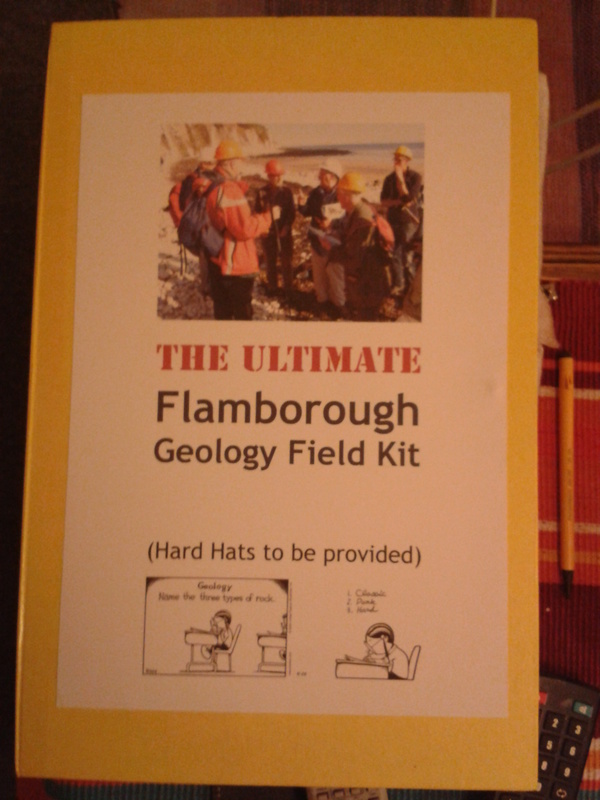 At the beginning of the year, Anna had sent each of us a parcel, containing the Ultimate Flamborough Geology Field Kit, complete with essentials such as a waterproof notebook, a hand lens, hand warmers and, of course, the obligatory geologist’s beard! I made good use of the hand-warmers to thaw my fingers as we drove round the coast to our next area of interest, Danes Dyke. Research is being done here on the glacial deposits, with implications for further understanding of the last ice sheet in eastern England. 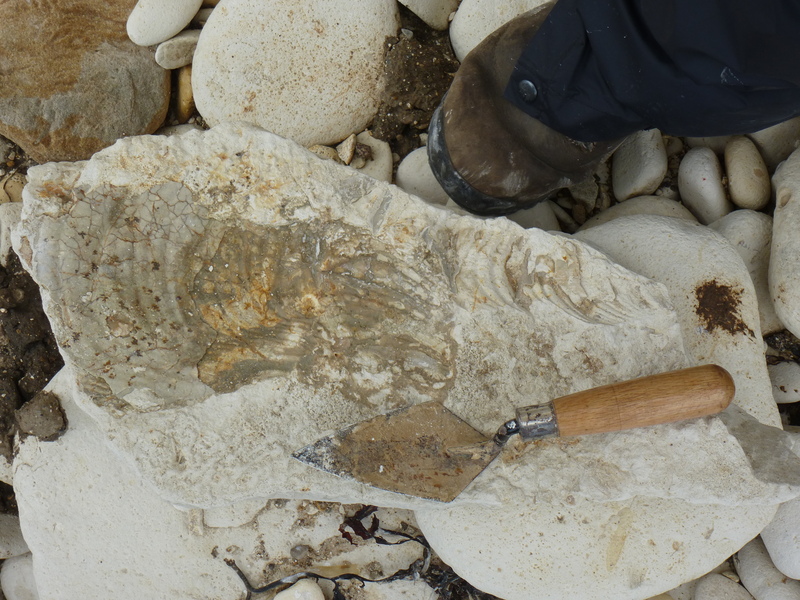 We searched for erratics and fossils, finding belemnites, fossilised oysters, fan corals and inoceramids, amongst many others. 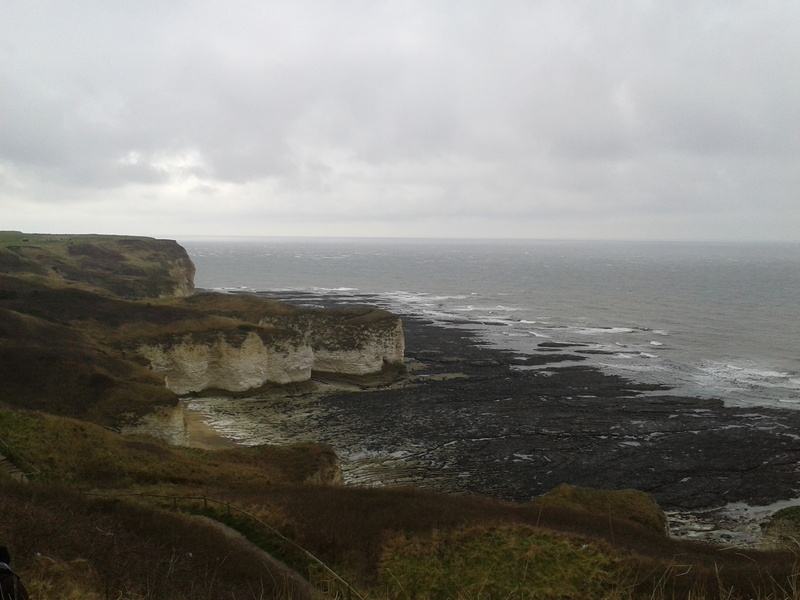 The cliffs towered above us, seagulls struggled to land in the fierce wind, and the tide was coming in fast, so after about an hour we headed for the warmth of the pub. Things from this trip that interested me: the chalk shelf which stretches far out to sea and is an important marine habitat, with an abundance of plants and animals, including a vast kelp forest; fault-lines and the general idea of faults; the creation of flints; evidence for climatic cycles in the chalk; horizontal boreholes; how amber is manipulated for jewellery; snails evolving differently on one side of Flamborough Head to the other; ‘getting your eye in’ as a fossil hunter. I look forward to working towards the exhibition – will put updates on here.